A gun has gone missing, and it might be Apple's doing. 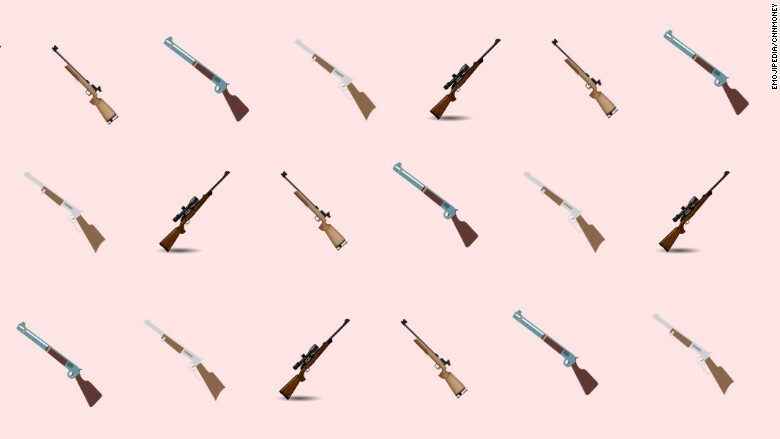 The decision to strike the rifle was made at a Unicode Consortium meeting in May. Apple (AAPL) and Microsoft (MSFT) argued against it, according to Buzzfeed's premier Unicode beat reporter Charlie Warzel. Apple was the company that first suggested removing it and said it would not include it on its operating systems, according to Warzel's source. An emoji called "modern pentathlon" depicting a man firing a pistol was also removed. The Consortium is the governing body in charge of the increasingly popular emoji standard. It determines what new images are added, then the characters are eventually supported across various operating systems and services. Apple and Microsoft are members of the group, which also includes Google (GOOG), Facebook (FB) and Yahoo (YHOO). A Unicode member who was present at the meeting told Buzzfeed the decision shows that major tech companies are "truly realizing what a big deal these emojis are."